Last week, the high tide was made all the more beautiful by the warm weather and clear skies. This week, it was back to overcast conditions and a low tide. 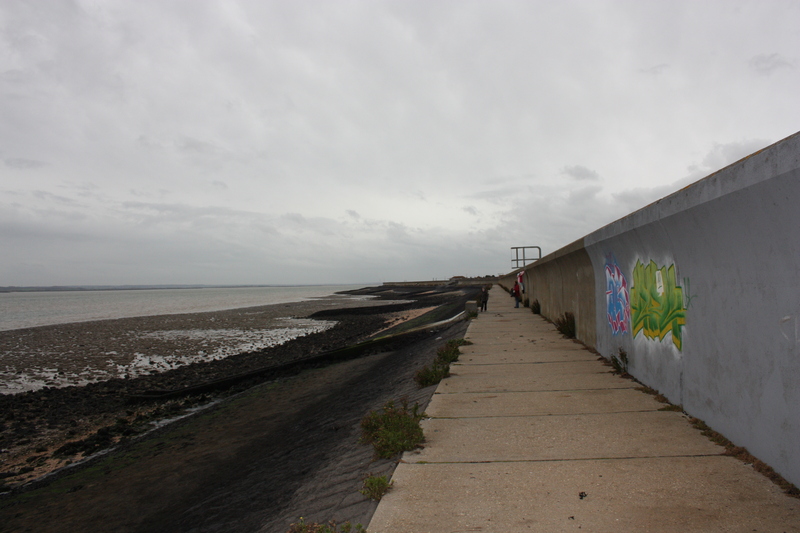 Today was the first section of Canvey Island. Canvey Island has been populated for at least 2,000 years. During Roman times it was known as the Convennos Insula (“insula” being Latin for “island”), and by 1255 it was known as Canaveye. 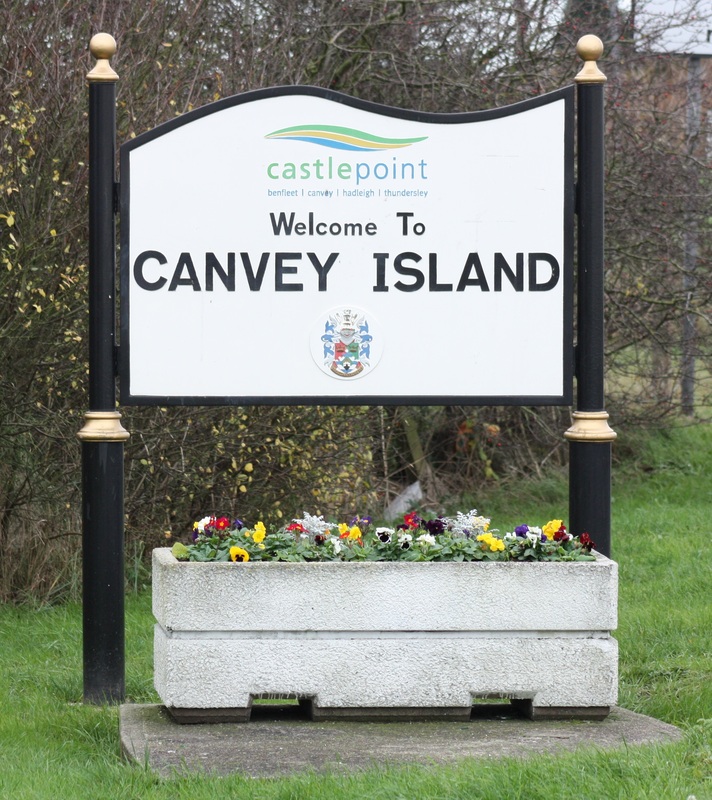 The “ey” in Canvey denotes an island, so the word “Island” in the modern day name of Canvey Island is in fact a repetition. Canvey is flat and low, and therefore the tidal waters have always been of concern to those who live there. In 1622 funds were raised for a sea wall to be built around the whole of the island. A Dutchman named Joas Croppenburg was engaged for the job, the Dutch being well experienced in the construction of sea defences due to the topography of their homeland. It was agreed that the Dutch would be given a third of the land reclaimed by the construction of the wall, known as the Third Acre Agreement. Many Dutch settled here, although lots then returned home during the Anglo-Dutch wars in the 1650’s to 1670’s. Still, many of the road names are of Dutch influence (Van Diemens Pass; Zeider Pass and Aalten Avenue, to name but three we passed). Further sea defences were constructed at various points in time, however, flooding was a threat then and remains so even today. Records of floods exist from as early as 1099, and some have been devastating. In 1881 some of the eastern tip of the island had to be abandoned to the sea after a flood washed away three miles of sea defences. However, the worst of the flood disasters to hit Canvey came in 1953. On 31 January an enormous surge tide struck the eastern coast of Britain. In Canvey it breached the sea walls and flooded the island. Many of the homes were (indeed are) bungalows, and many residents had to break through their own roofs to escape the water. The night was chill, and exhaustion and exposure took their toll. Fifty eight people died, and not one building on the island escaped damage in some form or another. Twenty five thousand people had to be evacuated. Today, a sea wall continues to encircle the entire island, and this section of the walk, over six miles in length, simply follows that wall. The wall passes alongside a golf club, around what I think are drainage works, and by some housing estates, but it must be said there was not much the walk offered in terms of beauty. 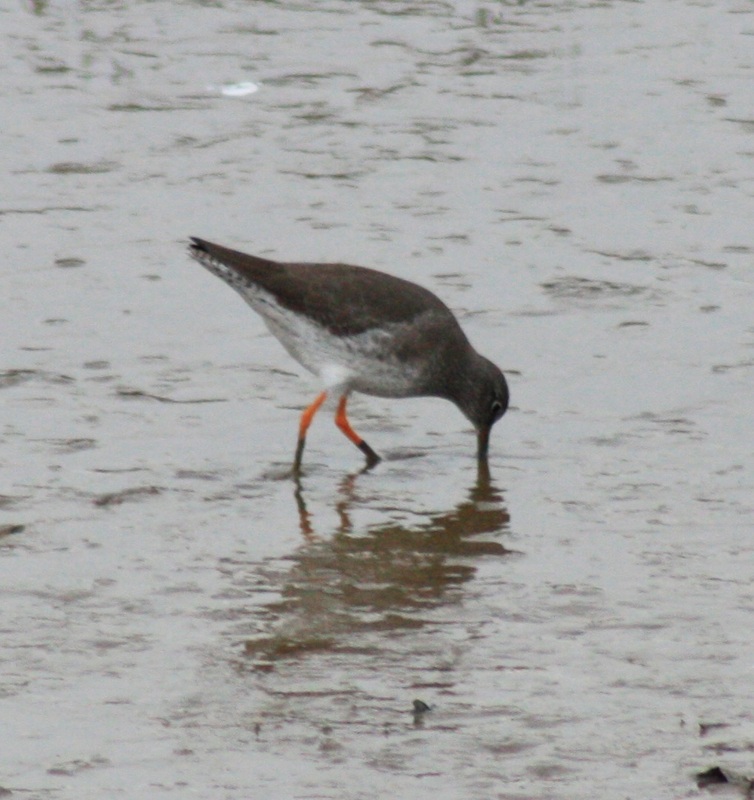 There was some wildlife on the mudflats to offer a distraction at times, but this walk was mostly a “heads down and march on” affair. It was useful to have a sea wall to do the navigation for us, so we could stride on without having to stop and map read. What surprised us was the fact that much of the island seemed to be fenced off from the sea wall perimeter. As we walked by Newlands, which is a housing estate of prefabricated bungalows with a caravan feel to them, a stretch of palisade fencing with “private estate” signs prevented access from the sea wall. As we skirted round Canvey Heights Country Park there was also a palisade fence between us and the park. It felt unwelcoming, like we were shut out of the community. Eventually we reached Smallgains Creek, and had to cut inland in order to navigate round the creek and its moorings. 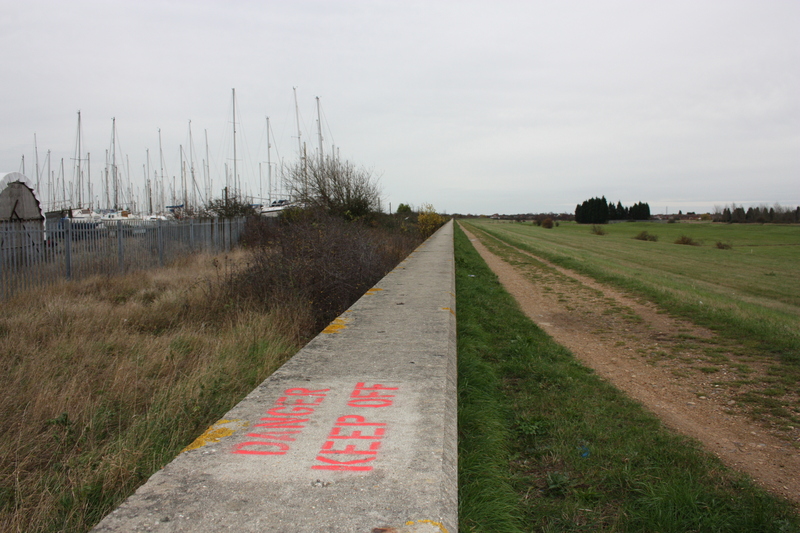 From the south side of the creek a one-way public footpath can be taken to Canvey Point, the easternmost tip of the island, which was reclaimed from the sea in the 17th and 18th Centuries. However, the sea defences were lost to the 1881 flood, and the sea has now claimed the area back. We decided not to venture out onto the sands, particularly as the tide was due in shortly, but continued on our way, eventually hitting the south coast. From here there are good views towards Medway in Kent, which we hope to hit in a couple of months’ time – tantalisingly close, yet so far away. After having walked for several miles on the landward side of the sea wall, on this southern stretch we were able to cross to the seaward side. As we started walking west, the tide finally started coming in, racing at speed across the sands. It echoed off the wall as we walked, giving the strange sensation of being able to hear the rushing of the waters on both sides. The approaching tide is most welcome, particularly in overcast weather such as this. It brings movement, life and sound as the water replaces the cold and silent sands. 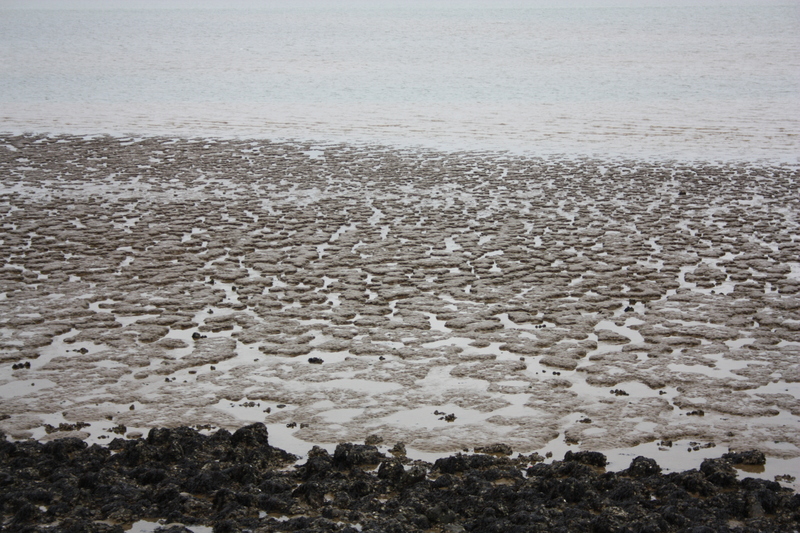 Hours earlier, the tide had covered the sands nearest the shore in an intricate jigsaw of rivulets as it had retreated. As we arrived at our final destination for today’s walk, the tide was coming back to cover over the patterns it had left. As for us, we stopped at the most inviting looking of the pubs we could find in the area. “Inviting” is not a fully accurate description of a relatively drab looking building, where the barmaid told me that they had run out of crisps and the patrons watched two local Essex teams play football on three oversized screens which dominated the bar. We called for a taxi back to our car at Benfleet as the first few drops of rain began to fall. This entry was posted in Essex, Islands and tagged Canvey Island, coast, Essex, travel, walking. Bookmark the permalink.